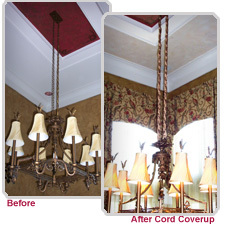 Our Chandelier Style Cord Coverup® is an elegant and easy way to cover ugly chandelier chains. Emphasize your chandelier not your chain! Applying the Cord Coverup® is simple with our sewn in Velcro®. There’s no need to detach the chandelier from the ceiling. With sewn in Velcro®, it’s easy to remove your Cord Coverup® for cleaning or to change out with seasonal decorating. 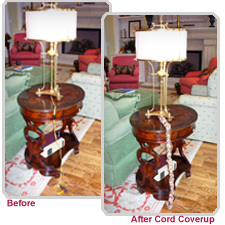 Our Chandelier Style Cord Coverup® is 6 feet long and 3 inches wide. TIP: When ordering our Chandelier Style Cord Coverup® a rule of thumb is two times fullness. Example: A 6 foot chain would need two Cord Coverups®. This product also works well to cover computer cables. Simply bundle them inside the Cord Coverup®. However, we do not recommend this product to cover Lamp cords. You would need our Lamp Style Cord Coverup®. With over 50 different color choices you are sure to find one that will match your décor. Click below to view before and after photos as well as see samples of our many fine fabrics. Our Lamp style Cord Coverup® is great for use on lamp cords, appliance cords, picture light cords, Christmas tree cords or anywhere you have ugly cords showing. Deciding on a color is simple. If you’re trying to blend the cord with your décor, choose a color that will match best. If you want to accentuate your Cord Coverup®, pick a color that best compliments your décor. For example: a black lamp Cord Coverup® blends great with dark granite countertops. Click below to find a color that’s best for you. Please visit our photo gallery to view before and after pictures of our Lamp Style. Our Wrap Style Cord Coverup® is more contemporary than our other two styles and is 6 feet long and 2 inches wide. This style is very fitted and sleek. This style can be used on both lamp cords and chandelier chains. 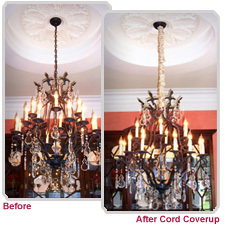 All you have to do is wrap the fabric around any chandelier chain or electrical cord. It is secured with adhesive Velcro® at the and for a snug fit. This style is best on small chandelier chains or lamp cords that have been shortened with enclosed twist ties to less than three feet. There are four color choices for this style Cord Coverup®. To see more pictures please visit our pictures/ideas page.